My name is Ms Lockett and I am looking forward to being your Food Technology Teacher here at Devon Intermediate. I was a student here at Devon and feel very lucky to be working at the school which holds so many positive memories teaching my main and preferred subject Food Technology and working with such a positive and dedicated Technology Team. I hope you have enjoyed your summer holiday and I hope to hear all about it. I am very excited to meet my Year 7 students this year and to catch up with my students from last year who are now going to be in Year 8. 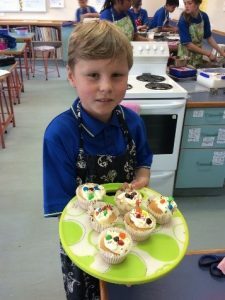 Following publicity generated about healthy school lunches, a food manufacturer has asked you to develop and make healthy bread based products that you could pack into a lunchbox. A local food store wishes to introduce a small range of cakes for customers to purchase for special occasions. Design and make a small range of cakes for the launch of this selling line. Your local bakery is looking to expand its coverage of the pastries it sells. Design an original idea that the local bakery can produce. Due to an increase in foreign travel and the variety of cultures that make up life in New Zealand, many people now want to eat foods from different countries and cultures. Design and make a multi-cultural dish which can be sold and served with a staple food. 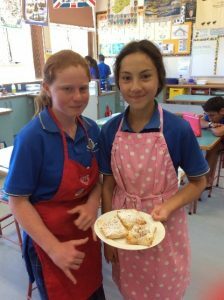 Here are just a few examples of what Year 7 and 8 will be preparing and cooking…..
You will also get a chance to design, plan and make your own Food Product. 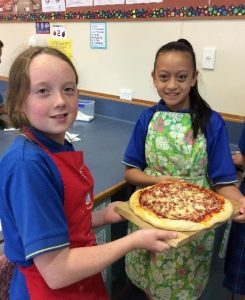 The dishes will relate to the brief and will follow the Technology Process in line with the requirement of the New Zealand Curriculum when teaching a Technology subject. I am aware of allergies and cultural preferences and prefer students to take ownership of these by keeping me informed of their own individual needs so that these can be a consideration during the planning and making process. Technology room so that they may be inspired to safely prepare and cook meals for you at home! And yes cleaning up is part of the process too!! So please enjoy the food! to taste and enjoy! You will also need to bring a blue or black pen, a glue stick, colours and a clear file to put your recipe and any written work into every lesson. If you have any questions please visit me in the Food Technology room.